‘Tis the season to be merry! What better way to put a smile on the face of a fitness enthusiast then by getting them what they really want? Give Santa Claus a break and use this holiday gift guide to help you pick out the perfect presents. From workout gear to meal prep accessories, our selections are sure to be a hit for that special someone. This makes a wonderful gift for the bodybuilder in your life. Store all your meals in three leak-proof, 27-ounce portion control containers with four snap tight clips to seal in freshness and prevent leaks. Just because it’s called a “cool down,” doesn’t mean you should be cold after your workout. In fact, that’s one of the easiest ways to get sick. This zip-up hoodie is easy to throw on your way out the door to keep your muscles warm. If you look around the gym, almost everyone has headphones. But earbuds can get sweaty and slip out of your ears. Cords can get tangled in the weights. With these wireless, on-ear headphones, you can turn on your favorite playlist, tune out the world and focus completely on your workout. Make sure you never forget your workout essentials. This bag lets you carry it all—water bottle, supplements, and towel—with an extra roomy compartment that’s perfect for your sweatshirt. Many athletes consider soreness the sign of a good workout, but some days it gets in the way of the most basic actions. Alleviate your discomfort with these two foam rollers—one soft, the other firm—that releases tension as you roll it across your muscles. It’s essentially a deep tissue massage, bringing blood to the area to help speed up the recovery process. Let’s face it—a chic bag will go great with your newly sleek abs and ripped arms. This modern tote packs away four meals and even has space for your laptop, folders and chargers, all in one convenient place. Never spill a scoop of supplement powder again. Simply squeeze a serving of your favorite Liquid Water Enhancer into your water, and you’re ready to go! Each supplement comes in two delicious flavors and helps you accomplish your fitness goals. When you look good, you feel good, and that’s especially important on leg day. 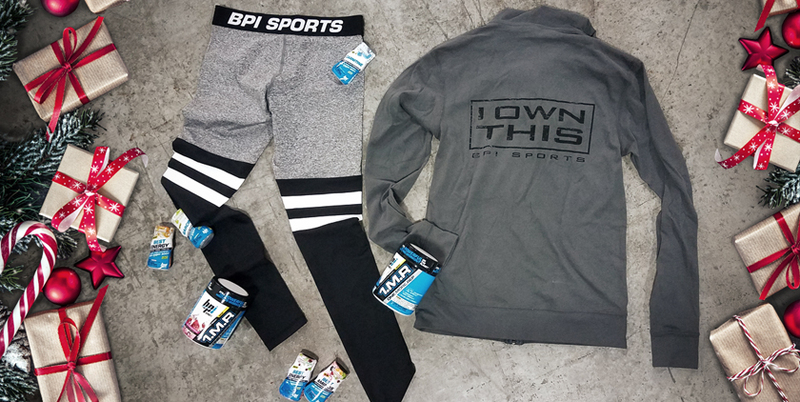 Slide into a pair of BPI Sports Bombshell Leggings to flatter the curves you’ve been working so hard on. Branched-chain amino acids (BCAAs) support muscle growth, recovery, performance and weight loss. They’re the ideal supplement for almost every goal, and should be taken throughout the day. Now, BPI Sports best-selling Best BCAA™ formula comes in four, lightly-carbonated, soft drink flavors! It feels like you’re drinking a soda, but you’re really working towards your goal! Use it to replace other sugary drinks at meals or to satisfy a sweet craving. Get more of your fruits and veggies with this powerful blender. It easily pulverizes fruits, vegetables, and other superfoods into a nutritious juice, perfect for breakfast on the go. You can even add a scoop of your favorite BPI Sports supplement! This convenient set eliminates the need for more storage space. The compact design is easy to store anywhere at home and one dumbbell functions as an entire set! The stronger you get, the more weight you can add, which makes it easy to track your progress. We hope this holiday gift guide helps you pick the perfect present! Sometimes, all it takes is the right gear to motivate someone to reach their goals.